Dave Grohl and his mother Virginia appeared as guests on CBS-TV’s The Late Show with Stephen Colbert on April 26, and video from the program is available online. 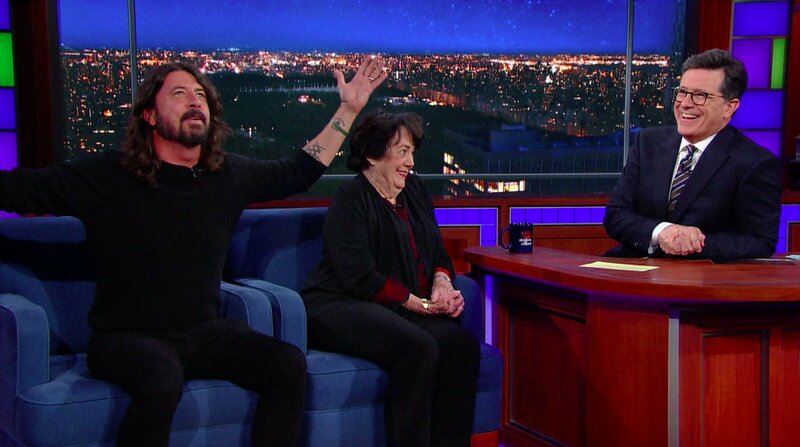 Along with reviewing teacher’s comment on Dave’s sixth grade report card, the Grohls also spoke about how the loss of his bandmate Kurt Cobain affected them as a family. The Foo Fighters leader wrote the foreward for “From Cradle To Stage”, which also sees Virginia discussing music career choices with other parents, including the mothers of Rush’s Geddy Lee, Maroon 5’s Adam Levine, and Mike D of The Beastie Boys, among others. The Foos will play The Bottle Rock Festival in Napa Valley, CA over the May 26-28 Memorial Day weekend before heading overseas for an extensive series of summer festival dates across Europe.